I've weathered plenty of hard parts for various props, but now I need to weather some fabric and I haven't the first clue where to begin. Are there any tried and true techniques that anyone has used before? 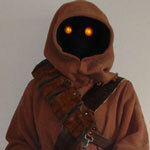 I am working on an X Wing flight suit, so I am aiming for a well-worn, slightly grease stained look. I'm nowhere near being an expert, but I definitely recommend testing out the techniques before using them directly on the finished piece. If you want tear, I know several people use cheese graters and low-grit sandpaper on the area they want. It'll pull on the fibers so you can range from looking fading to frayed edges. If it's an actual tear-open, you might have to cut a small hole with a pair of scissors prior, just to help loosen the fibers of the fabric. As for stains, coffee and tea are good natural stain makers. However, depending on which flight suit you're working with, they might not stand out as much - though I think it should come out decently on orange. Still, if it doesn't, you could try the same technique of washing down paint as one uses on props. Only instead of oil-based paint, go for the acrylics. If you just want to create a fading-worn-out look, you could dab a bit of bleach on the area and leave it laying in the sun for a bit. I strongly recommend testing this out first though, or you might find yourself with an unexpected surprise. A pair of black trousers turned brown in some areas when I used this technique. And if all fails, you're welcome to lie it down on your driveway and have fun driving over it a few times. You can also tie it to the back of your car and take it for a road trip in a trail. Though, this might cause too much weathering. I think I read somewhere on the X-Wing Pilots forum that weathering was fine, so long as it was kept to a minimum? Oh! If you want to weather something only for a day, you can always buy real cheap eye-shadow in earth tones and with a paint brush lay it in layers on the fabric. Mixing up a bit of green in the mix and it'll looked like you just had fun rolling across the ground. There's also using ashes from your chimney or campfire, but you need to be careful with where and how much you apply, as there's no guarantee you won't leave your mark on chairs or other people you come in contact with. I have created a dirty look by using black spray paint. Spray the air near the fabric not the actual fabric. The paint mist will settle on to the fabric creating a nice gun powder residue look. Hold fabric closer or further away from mist depending on how dark/dirty you want it to look. And I guess you can use cooking spray for grease stains for similar effect. Thank you both, that's quite helpful. I have heard of some people using very diluted acrylic paint on fabric as well. Has anyone tried this method? hey Andrew yes I've used watered down acrylic paint in a spray bottle for Rey. I went to Michaels and got some cheap paint, different colours and it seemed to work well. the only problem is washing anything. it does come off if you wash it so the spray paint method is also a good way to do it. Its a nice way to do it as you can control how dark you want the weathering with how much water you add. When I was weathering my duster for my Snowtrooper costume I used a spray bottle with a mixture of tea and powdered tempura paint. I also used some black shoe polish. use browns instead of black. it makes deeper light wells and resembles dirt more. sandpaper takes the shine off parts you want to look a bit.worn. a cheese grater makes fabric very distressed so apply a little force at a time, in one direction, so it looks like repetitive motion caused it. I used diluted acrylic paint on my husband's Tusken as well as coffee, tea and stone textured spray paint. For good measure I also used some graphite and ground that into the fabric for really dark patches. One thing you may be absolutely sure of - if an item does not appear in our records, it does not exist! Works just like spray paint in terms of application, but as soon as it dries (quickly) you can toss it in the dryer and "set" the dye so it lasts a good long time, even through subsequent wash cycles.